Happy autumn! I'm a few hours early but my favourite season is finally here! With fall comes the crisp air and the fresh apples and pumpkins--an unexpectedly scrumptious member of the squash plant family. One of the first of many pumpkin things I anticipate making over the next few months was this lovely, dense pumpkin loaf with (almost unnecessary) cream cheese icing. Not going to lie, I made it to eat for breakfast this week because this time of year only comes around once, you know! It's really sweet, especially with the addition of the cream cheese icing (although there is absolutely no such thing as too much). The recipe called for 1½ cups of sugar and I think next time I'd just do 1 - the extra half isn't necessary if you're going to ice it! Now, it's time for the recipe! Preheat the oven to 350* and lightly grease a loaf pan. In a large bowl mix together flour, baking soda, salt, cinnamon and nutmeg, and make a well in the centre for your wet ingredients. With a mixer, beat together eggs, sugar, pumpkin, oil and water until smooth. Add the wet ingredients with the dry ingredients and mix together until thoroughly incorporated. Pour batter into a loaf pan, making sure it is evenly distributed. Bake for 30 minutes uncovered, and after 30 minutes tent with a piece of aluminum foil to prevent it from getting too dark on top. After 20-25 minutes, check and make sure the top of the cake is firm. If it still looks wet, remove the tin foil and bake until a toothpick is inserted and comes out clean - about 60 minutes of baking time total. I eyeballed the cream cheese frosting. I used a quarter of a 250g block of cream cheese, ¾ cup icing sugar, roughly a tablespoon of butter and a splash of milk. My icing wasn't as thick as I had anticipated, but the addition of the milk pushed it closer to a glaze than a dense frosting. There you have it! 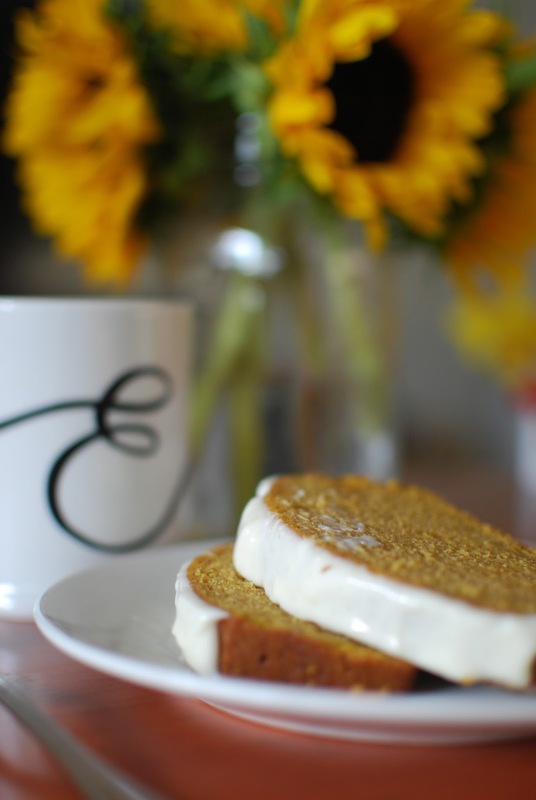 The first pumpkin thing on the blog to welcome autumn! There are a few more things up my sleeve so stay tuned. Until next time, happy making!